I love it! Not only does it use up all my scrap yarn, but it has also given me a chance to step out of my color rut. Plus, there’s nothing like a repetitive pattern to help me relax and catch up on my Dr. Who episodes! As you can see, the bobble pattern is staggered. 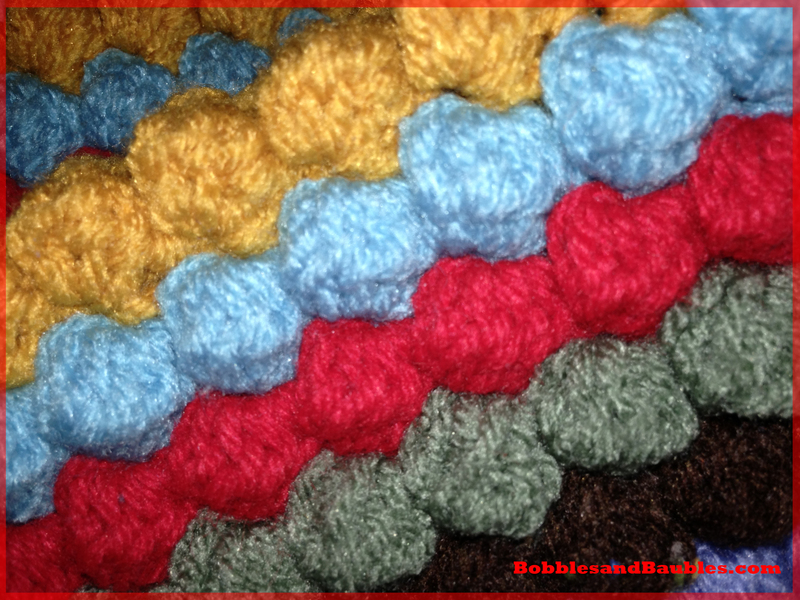 This helps to eliminate any gaps between bobble rows and makes for an ultra thick, warm afghan. When I crochet, I tend to crochet very loosely. For this blanket, I am trying ever so hard to tighten up my stitches. It gives the blanket a fuller, thicker feel. It’s a work in progress. My fingers tend to have a mind all their own when I get into the swing of it. The bonus part of this blanket is that not only is the front attractive, the back is quite lovely as well! So, if you would like to try your hand at it, here is my pattern. I have not finished mine, so I’m not sure what type of border I will put on it, or if I’ll put any border at all. 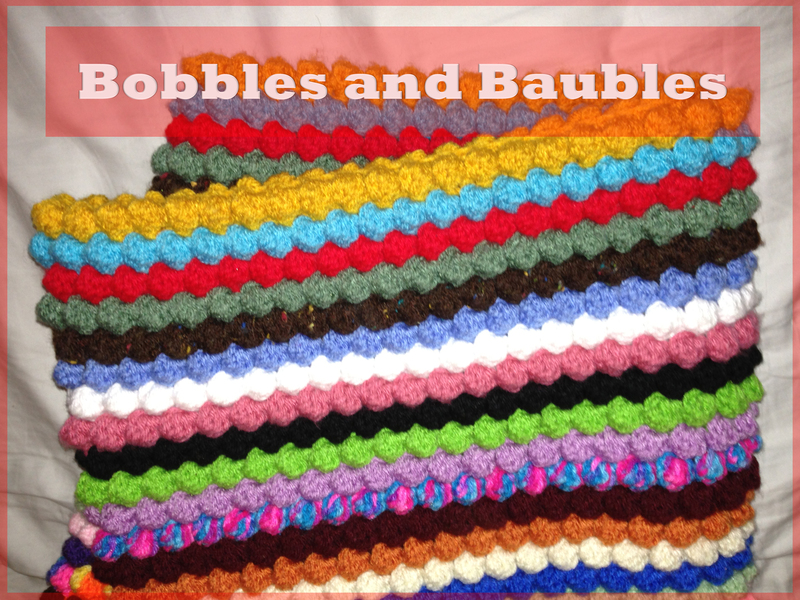 As it stands now, the edging looks as if the bobbles are floating which is very cool! Either way, when I get to the end, I will update this post. Happy Hooking! Row 3: SC (in both loops) in second ch from hook. Sc in every ch thereafter all the way across. Cut yarn leaving a long tail of at least 6 inches. You will have to weave this end in later. Repeat rows 2-5 until desired length is achieved. Final Row: Skip last step (ch1 and turn). Bind off. How lovely that blanket is! And I’ll bet it’s as warm as toast! But….does it feel as heavy as it looks? Lovely blanket, can’t wait to start it! 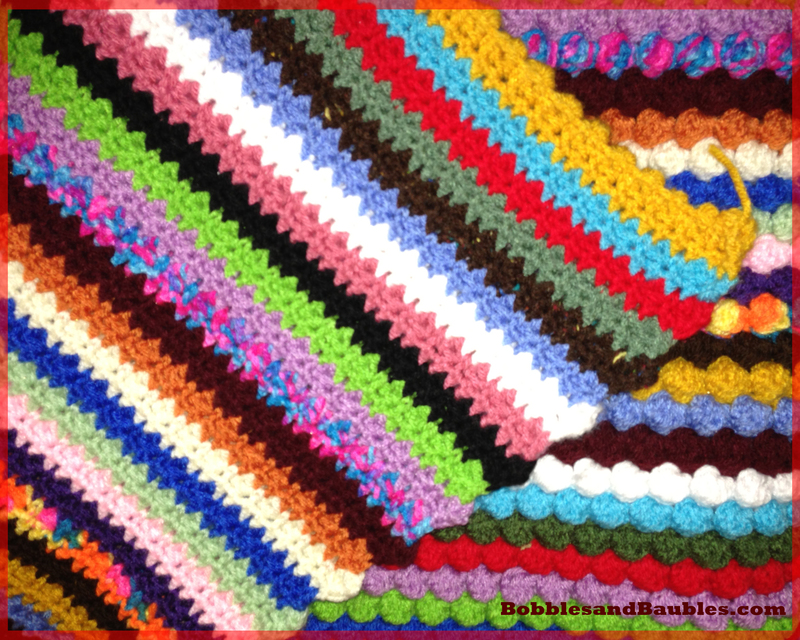 Do you lay out your scraps ahead of time? Or just whenever you have leftovers you use it? Also are your yarns all the same weight? Yours is absolutely beautiful! Thank you Terri! I just use what I have laying around. I do make sure it’s all the same weight though.